Widen the view of your camera PLUS Macro (Close Up) Function! 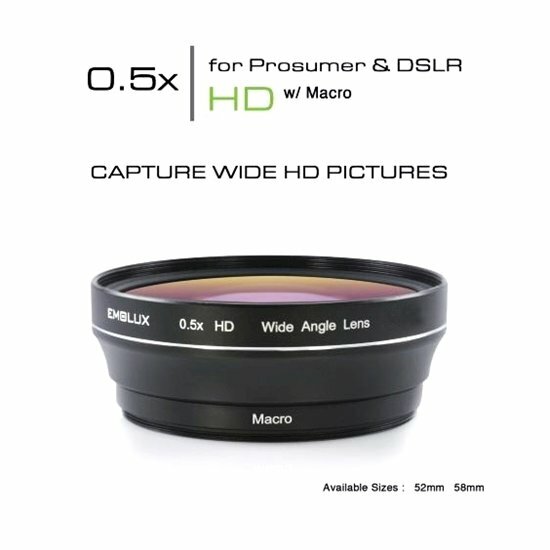 The Emolux HD 0.5x wide angle converter lens with macro (58mm) is designed to be used exclusively for prosumer or DSLR cameras. when mounted onto a digital camera, it enables the maximum wide angle to be increased by 50%, allowing more details to be captured in a single image. The 2 element optical glass system is fully coated to attain maximum light transmission and image clarity. other features include detachable macro attachment for closeup photography, darken glass edges and pro matt housing finishing to minimize external flare and reflection from entering the lens. 67mm front filter threads further allows the placement of filters for other required Effects. Suitable for Canon, fujifilm, Nikon, Olympus, panasonic, Sony, samsung lens with filter size of 58mm. To find out your lens' filter size, look out for marking (On your lens or lens cap) like ⌀58, which means the filter size is 58mm and you should get this wide angle converter lens (58mm).